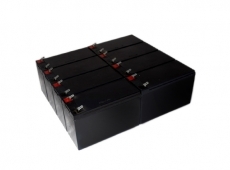 Replacement battery solutions for a wide range for single phase and office purpose uninterruptible power supplies (UPS). Our systems offer high reliability providing standby power when you need it most. As with all standby power systems, a UPS is reliant on battery power to protect connected equipment and maintain reliable service in the event of a power outage. Make sure you install the best system possible with a battery kit from Blue Box Batteries.